Change your rep scheme to reverse pyramid training to break through plateaus. 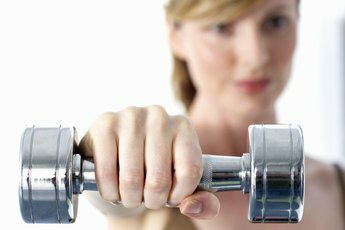 When losing fat, most women opt for the elliptical, bike or treadmill, and while you might sometimes do something a little different and attend a class, it's unlikely weight training gets much attention. Weight training however can be extremely beneficial for fat loss. Not only does it build lean muscle mass, which can increase definition and boost your metabolism, but it burns calories and sheds fat, too. Base your workout around reverse pyramid training for fast, effective fat loss. Pyramid training is the principle behind many bodybuilding programs and involves starting with a light weight performed for a higher number of reps, then increasing the weight each set while decreasing the number of reps. Reverse pyramid training is the opposite. Start with your heaviest set first, performed for six to eight repetitions, then reduce the weight each set, while increasing the number of reps. Reverse pyramid training lets you work across a number of different rep ranges and accomplish different goals with just a few sets. For example, you could perform a heavy set of five reps, a lighter one of 10 reps, then a final set of 15. 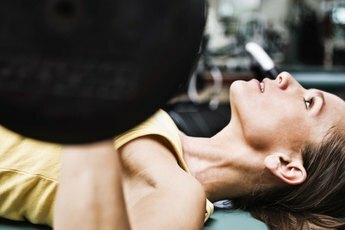 According to Bodybuilding.com's "Female Fitness Bible," these rep ranges are suitable for strength, muscle growth and muscular endurance respectively. Reverse pyramiding is also an effective way to increase your training intensity. A high training intensity leads to more calories burned and faster fat loss. Train three times per week, hitting your whole body each workout. Full-body training is the most efficient method for fat loss, claims strength coach Rachel Cosgrove in her article "Strength Training 101." Perform two leg exercises and two upper-body exercises each session. Multi-joint compound free-weight moves are also more effective for burning fat than machine or isolation exercises, adds Cosgrove. Your workout could consist of squats or lunges, followed by deadlifts, then bench or dumbbell presses, and finally dumbbell or barbell rows. Don't be fooled into thinking that training heavy will make you big and bulky and that light weights for higher reps are better for fat loss and toning. This is a myth. Training heavy will force you to work harder and burn more calories in the process. Add one or two lighter warm-up sets before getting into your first heavy set and perform three sets as part of each reverse pyramid. The first set should be for five to eight reps, the second for nine to 12 and the final for 13 or more. Consult your doctor before starting your new workout and ask a trainer at the gym if you need help with any techniques. Combine your training plan with a calorie-controlled diet for faster fat loss. What Is the Best Set and Rep Kettlebell Training?